What brought voters to the polls on Martha’s Vineyard in eye-popping numbers on election day? A full two-thirds of registered voters on the Island turned out to vote on a drizzly Tuesday, a staggering percentage for a mid-term election with few local races in doubt. Up-Island, the figure was closer to three-quarters. 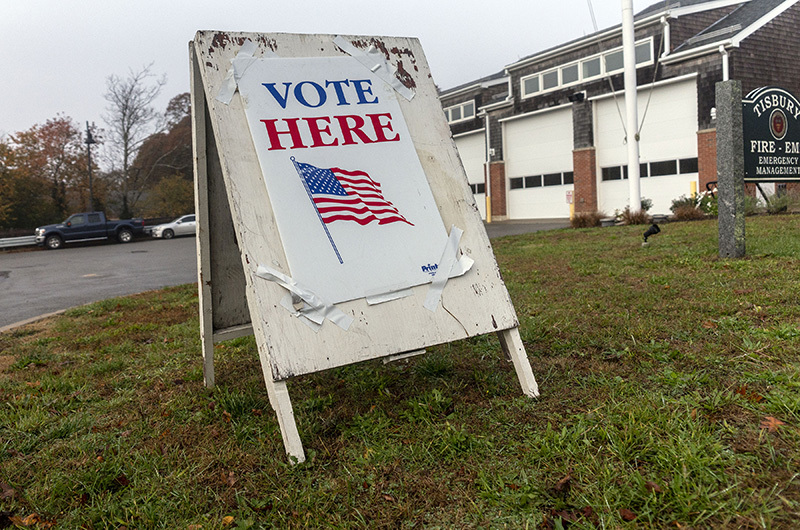 In West Tisbury, a remarkable 74.8 per cent of registered voters cast ballots. While pundits marvel at the nationwide turnout, now estimated at 47 per cent, this little corner of the country made that figure seem paltry. Surely it wasn’t the race for clerk of courts, one of only two contested Islandwide seats (the other being the seventh slot on the Dukes County Commission). George Davis was elected clerk over Anthony Piland in a landslide, and Robert Zeltzer failed to win another term on the commission by just seven votes. Probably not the race for governor, where popular Republican Gov. Charlie Baker easily won reelection statewide and outpolled Democrat Jay Gonzalez here by more than 1,000 votes. Possibly the race for state Senate. Democrat Julian Cyr, bracing for a tough challenge from Republican John Flores, instead got the nod for a second term from every town in the district. Or maybe it was Question 1, a pitched battle to set minimum quotas statewide for hospital nurses. The initiative failed by 40 percentage points statewide, but by just 2 per cent here on Martha’s Vineyard. Maybe it was simply the dawning understanding that voting matters. In the aftermath of a bitter and confusing 2018 midterm election, that’s something to build on.